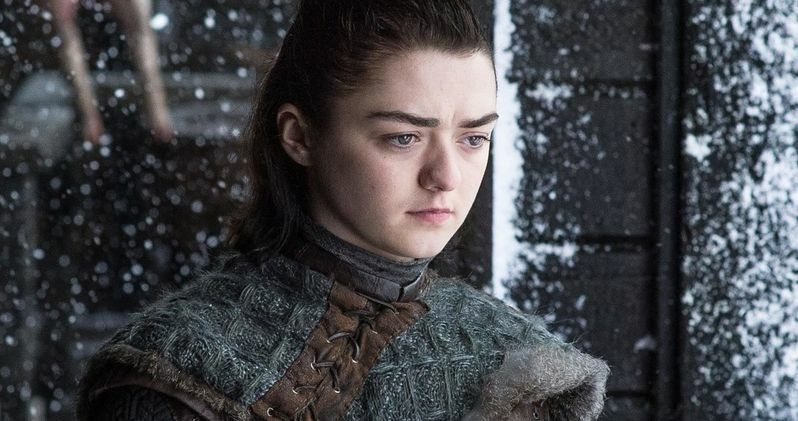 Maisie Williams' time on Game of Thrones is officially over. The young actress has officially wrapped shooting on the 8th and final season. It's all over for Arya Stark. But if we're to believe a few hashtags, perhaps this girl will live to see another day. Maisie Williams had this to say about her final stint on the popular HBO series. "Goodbye belfast. Goodbye Arya. Goodbye Game of Thrones. What a joy i've had. Here's to the adventures to come. #lastwomanstanding #barely #immasleepforthenextfouryears #justkiddingidontsleep." The note was accompanied by an image of the actress' blood-soaked tennis shows. We can only image what happened to them. Season 8 will officially bring the final episodes of Game of Thrones, but there are spin-offs in the works, so it's not entirely over. The last season will finally reveal the rightful heir for the Iron Throne of Westeros. Judging from Maisie's hashtag, it very well could be Arya. Fans have had to wait extra long for new Game of Thrones episodes. Normally, the new season would have aired by now. But each of the final 6 episodes is being shot like a feature film, and production was extended throughout the year, with the hit series scheduled to premiere sometime in 2019. It's expected that Williams' playful hashtags will start some fierce debates online. She posts #lastwomanstanding and #barely as potential spoilers, but surely at this stage she knows better than to do that, right? Though, it doesn't sound so unlikely that Arya will outlive the remaining female characters currently returning on the show. Sansa's days seem long over due, and the death of Queen Daenerys has been teased quite a bit lately. Though, she may simply be referring to the fact that she shot her scenes last, and all her co-stars have already gotten to go home. Sophia Turner recently got a tattoo that sparked fan theories about her character's survival, but she later assured that the words tattooed on her arm about the Stark family had nothing to do with the actual end of the show itself. As far as we know, Game of Thrones is still shooting. Emilia Clarke has already announced her departure. It isn't clear who else remains on set. The end of this iconic show is said to be 'unpredictable but satisfying' by Sophia Turner. But fans still have more than a year to wait and find out.